Discussion in 'Puppet Building and Performing' started by argonautika, Nov 29, 2012. Last Christmas I received a WhatNot and though I like it I feel the size of a Muppet should be bigger. I imagine it has something to do with all the behind the scenes photos i have seen over the years of the Muppet Show and Sesame Street. I have decided I would like to make my own WhatNot. As this is my first puppet in this style I am using patterns and watching tons of tutorials. I am using the Roly Pattern and have the Borsa pattern coming. 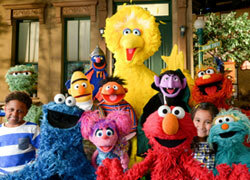 In all my research I can't find any kind of dimensions as to how big some of the actual muppets are. Does anyone have any references or resources that I am not aware of? I appreciate any help anyone might have. I really enjoyed the discovery of the forum and many of the posts from the members on it. I made a similar thread when I first posted here and people told me to base it off of pictures with Kermit. In other words I don't think that info really exists other than the photo replicas sizes. well, if you think about it, they're all different sizes. Kermit's head was the size of Jim's hand. Fozzie's head is obviously a lot bigger. Prairie Dawn is tiny, Zoe was Elmo's size, and is now apparently little (or at least was for a time). It honestly just depends on what type of character/performance you're going for. The best approach - in my opinion anyway - is to make the puppet's mouth plate first so that it fits your hand (or the hand of the puppeteer you're building for) really well. Then design and build around that. Don't get me wrong, scale is often an important consideration when building puppets, but unless you have specific requirements I would worry about the puppet's flexibility and functionality first and foremost. JacobsBest and staceyrebecca like this. 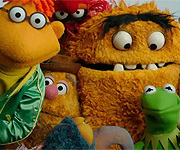 Yes, it is strange at seeing just how small a lot of Muppets actually are... but at the same time, it's also just as surprising to see just how big some of them are too. For example, more humanoid-like characters, like say Floyd, the Jim, Jerry, and Frank puppets, etc, are actually smaller than they appeared; but then, you look at the Fraggles, and the Fraggle puppets are actually pretty big. JacobsBest and Adam Kreutinger like this. Agreed, Buck-Beaver & D'Snowth. Size it for comfort of the performer and control the perception of size within the performance.